Below is a diary of work in progress - most recent updates are at the top! We hope you will prayerfully consider supporting the Organ Donation Fund. ​Here are more updates! 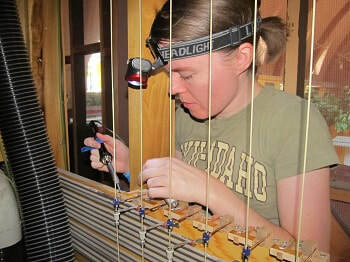 Katherine Bigelow is shown soldering to the custom Pedal contacts, connected to the Pedal trackers. 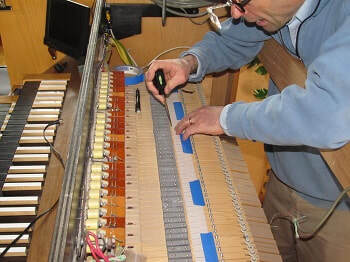 Special contact on the last key of the Great keyboard – general and closeup. 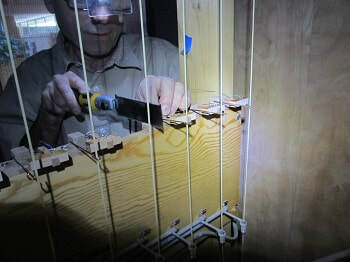 ​What remains is to build, install and wire a temporary switch panel on the console to control the four new functions (electric and octave coupling) and to complete the necessary connections to the relay. Then Phase 1 will be complete. We’re targeting the end of next week for that. We have already begun design work on Phase 2. Thanks to all for your wonderful support! A special thank you to all of you have contributed your financial support so far to this project! 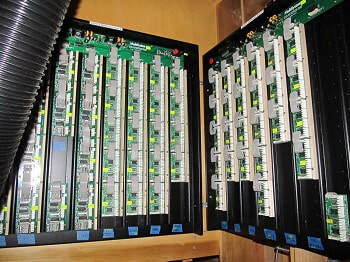 ​Photos below show the custom built contacts connected to the Pedal trackers and the relay, which consists of two large boards with connection points for 842 wires, and a relatively small “black box” processor. 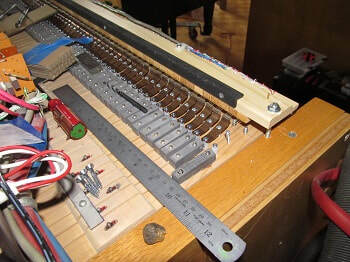 Phase One items completed including making and installing key contacts in the Pedal key action, installing special contacts for first and last keys of the Great (lower) manual and complete wiring of all contacts. 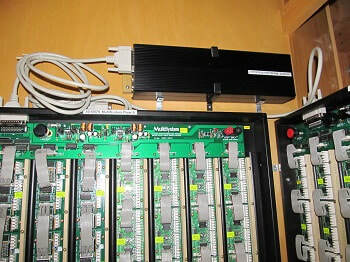 The solid state relay has been installed and now needs to be wired. David is looking to the end of July for the completion of this phase. ​Here are photos of work done recently. 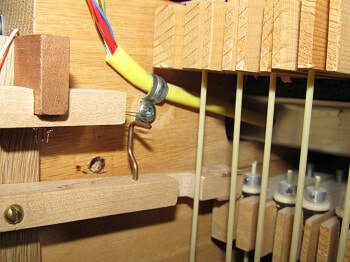 Make and install key contacts in the Pedal key action. 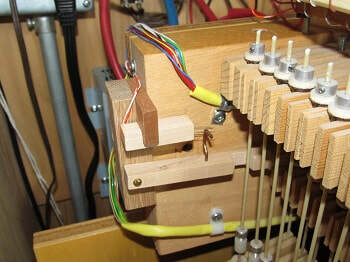 Install special contacts for the first and last keys of the Great (lower) manual and complete wiring of all contacts. 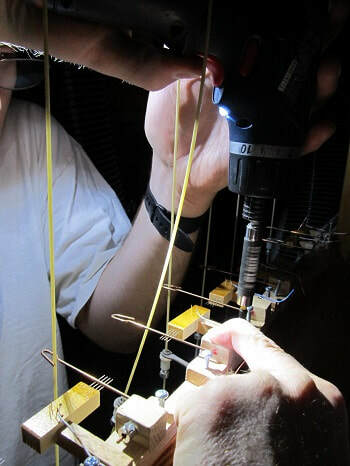 Install and wire solid state relay, currently in process at Solid State Organ Systems, Inc. Completion is currently anticipated at the end of June, possibly extending to the end of July. 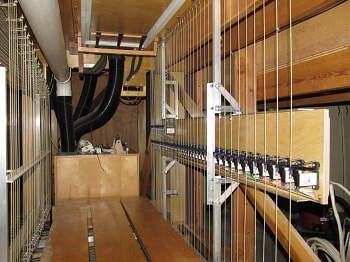 View of upper manual keyboard with console top removed, showing pneumatic actuators (boxes with corrugated tubing running to them) for the three couplers. 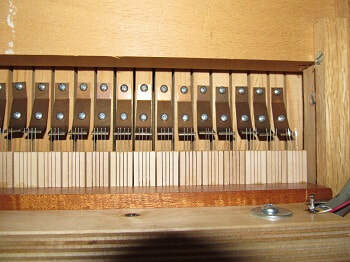 Contact plates installed (except the last one), and contact rail (61 individual contact blocks, each with four silver contact wires) mounted above the keys. 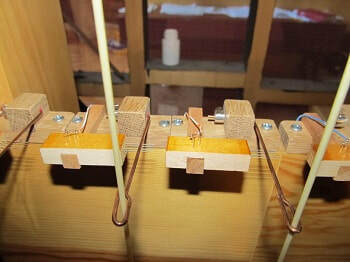 Coupler solenoids connected mechanically and electrically. 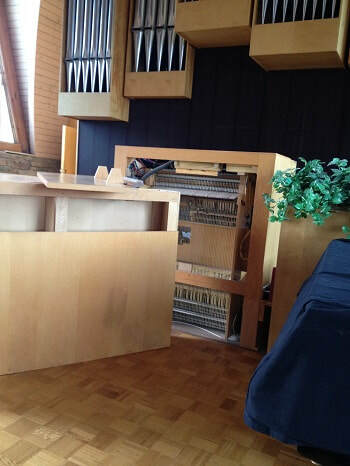 ​In the "before" image, you see the trackers to the Chor chest in the right half of the photo. 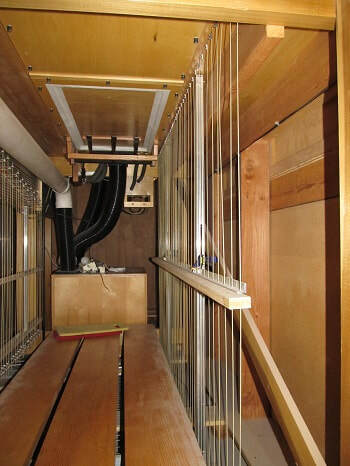 (The trackers in the left half of the photos are part of the Pedal key action, in case you’re curious). The trackers are the off-white fiberglass rods, about 2 millimeters in diameter. 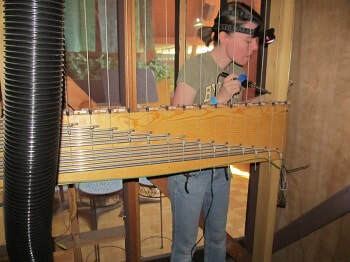 They pass through an aluminum rail with felted holes. Clamped to that rail is a long wooden stick (not part of the organ) which was used to mark the locations of all those holes. 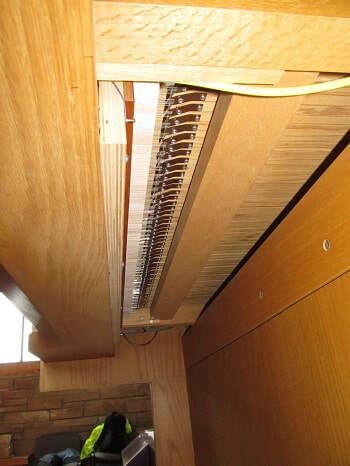 ​Looking straight up at the bottoms of the keys, you can see that each key’s contact plate is poised to contact four silver wires – real silver alloy. 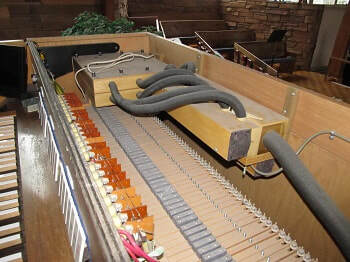 Thus, depressing a key sends an electrical signal to the organ’s “brains”, which in turn sends electrical power various devices to make added pipes play or activate additional couplers. 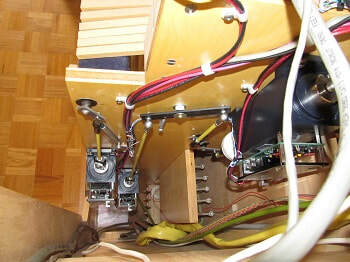 Views of the underside of the Great (lower manual) keyboard with contacts installed. ​Work begins! 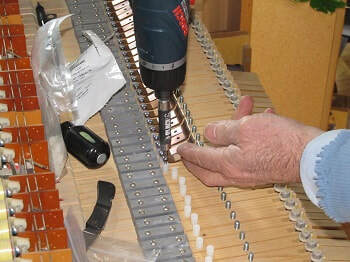 Contact "plates" installed on keys.